Do you think that tornadoes will continue to increase in strength and numbers throughout the coming years due to climate change? Or is it just the fact that we keep building more and more areas and therefore are more likely to get hit by large tornadoes? This tornado should be on your list. The loss of life is staggering considering how well prepared the state of Oklahoma is for tornadoes of this variety. Right now on CNN they just said that the National Weather Service only found 190 MPH winds, making it an EF4. There’s no way you can get all of the damage and scouring I’ve seen with just an EF4. I’m hoping that they’re still analyzing some of the damage because this can’t be anything less than an EF5. Ed – I think that population increases, natural fluctuations in tornado frequency and, primarily, bad luck are likely the causes of the increased fatality rates in the last three years. This tornado was like several others that formed the previous day (as well as every year on the Plains) but it happened to cross over a populated area. The 2011 season was the one that really broke the record books. Ry – the survey is commencing today. The tornado will likely be upgraded to an EF5 by Thursday. 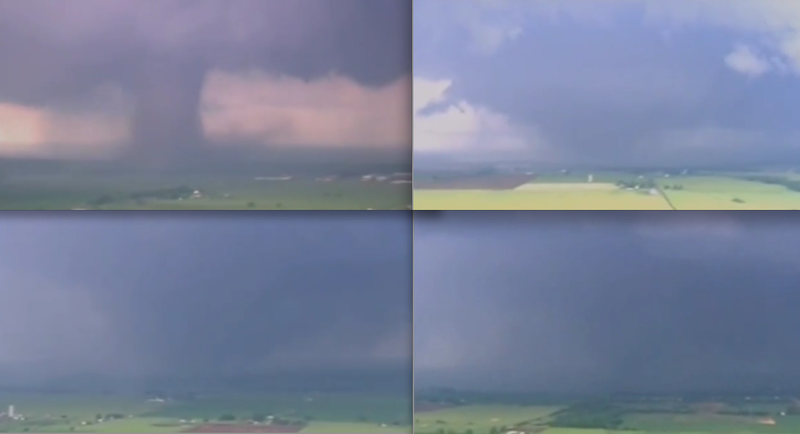 Comparing this tornado of 2013 to 1999 which was stronger? in terms of destruction ….. 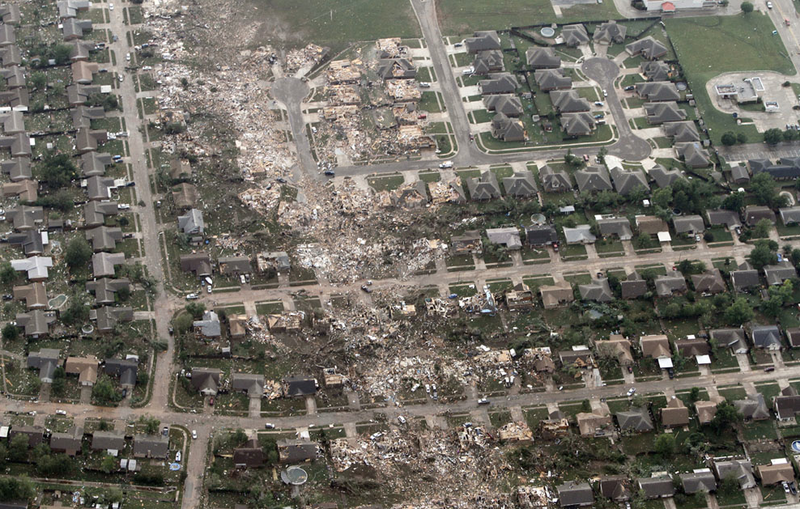 In the city of Moore, I’d say the 2013 tornado definitely left more intense damage, as seen by the higher fatality rate (less homes destroyed yet more fatalities) and the greater number of homes that were swept completely away, as well as more pronounced vegetation scouring. The 1999 tornado, however, was strongest southwest of Moore in Grady County. The damage in Grady County back in ’99 was more intense than what I have seen so far from the recent storm. I heard reports on news stations saying that indoor above ground saferooms in some of the destroyed houses didn’t stand up to the winds of this tornado. Can you verify that? 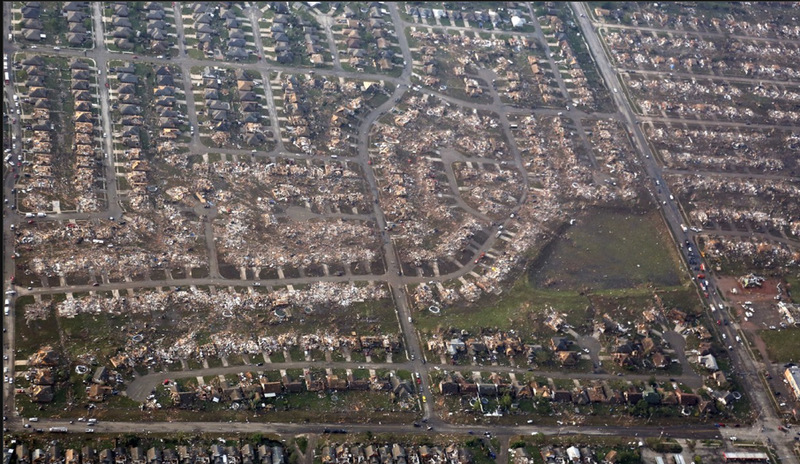 What was worse the Tornado moore or joplin? John – I have found no evidence indicating a safe room was destroyed. If there were any safe rooms in the EF5 damage swath, it would be interesting to see what the survey members find in the coming days. 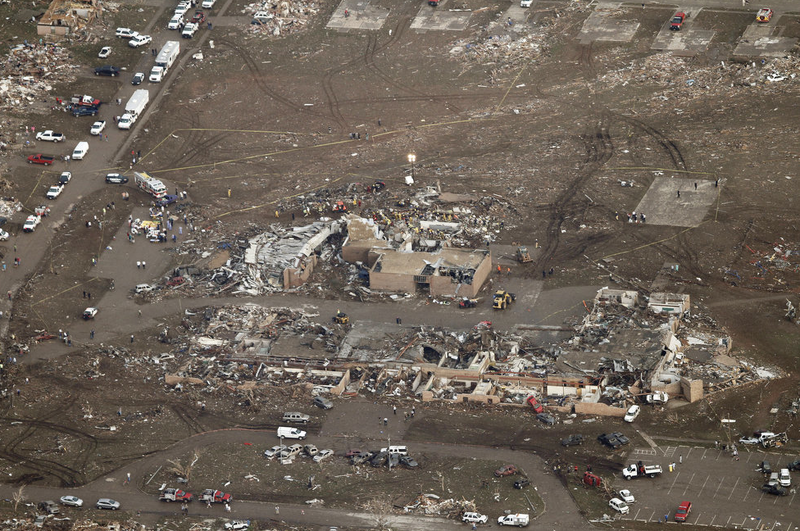 Brian – In terms of monetary damage and fatalities, the Joplin tornado was significantly worse. In terms of intensity, it’s hard to say. 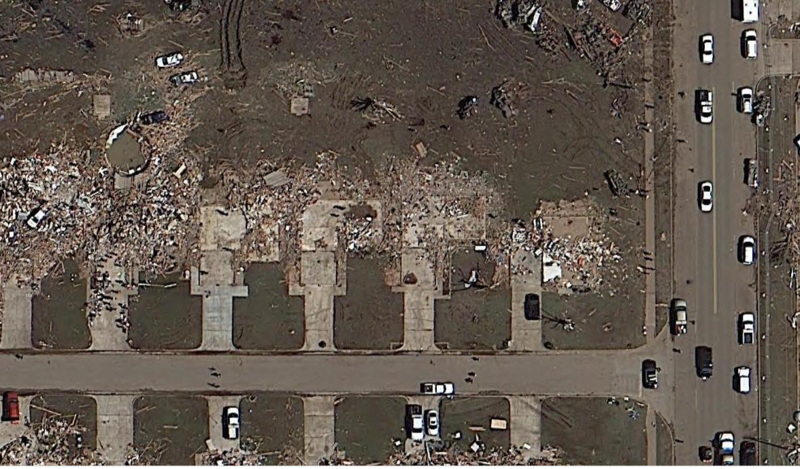 The Joplin tornado’s primary damage swath was much wider. 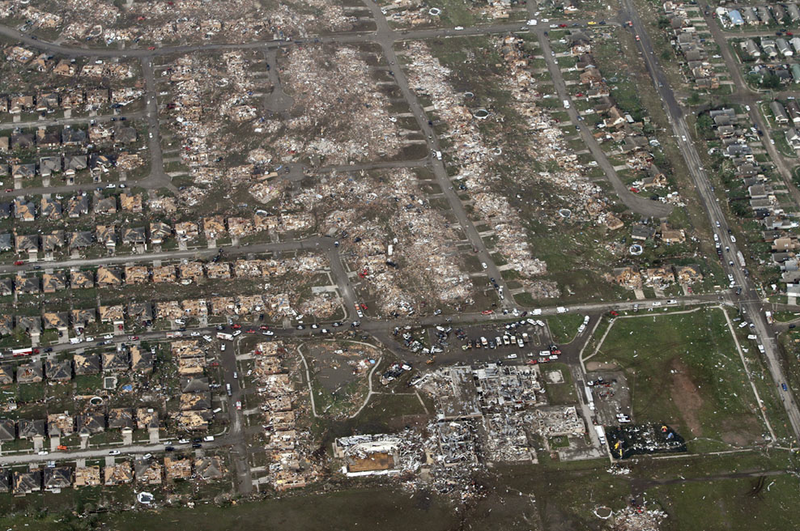 The worst damage from the Joplin tornado was very comparable to the damage in western Moore. Excellent write up. I noticed a very interesting feature regarding the ground scouring in this tornado. Many of the structures that sustained EF4 damage in this tornado were surrounded by intense, muddy ground scouring. I have suspected for quite a while that Oklahoma soil is more vulnerable to scouring (I have seen aerial videos of scouring from Goldsby 2010 path where trees were downed but not defoliated) A recent post from a user on Talkweather seems to confirm this. Oklahoma soil is apparently classified as a “loam soil”, which is quite loose and crumbly, and easier to scour. Just thought you might want to know. Buckeye – I make a bit of a note on that in one of my prior posts as the Bridge Creek tornado also caused scouring while under EF5 intensity. Additionally, in reference to your Goldsby remark, certain tree species in Oklahoma have rather sturdy exteriors that don’t always loose their bark even in EF5 winds. The NWS survey is ongoing, but I do know they deemed the damage at Briarwood Elementary to be of EF5 intensity. One of my chaser friends who was on the ground in the area told me the damage near Plaza Towers was the most impressive he witnessed, and the aerial images seem to support that. When the final report comes out, I’ll be interested to see what they say. 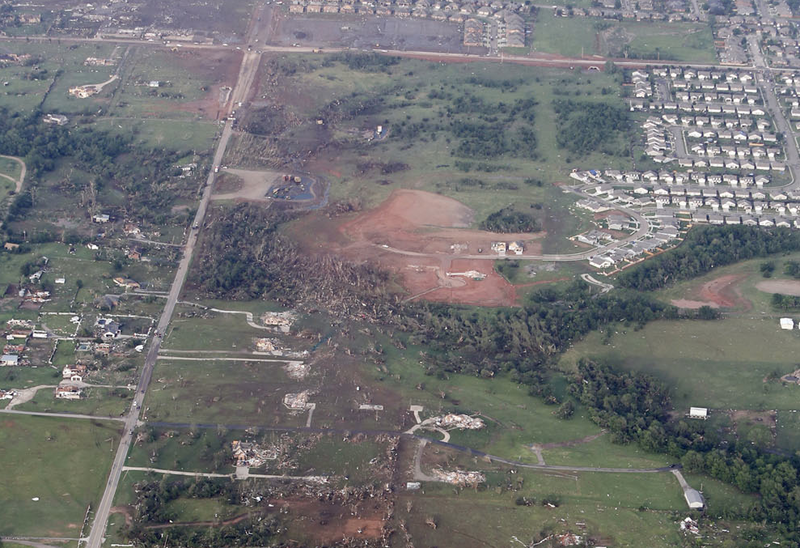 John – the tornado’s inner core passed north of the theater and over the Moore Medical Center, so it only encountered winds in the EF1 to EF3 range. I heard that it directly hit a movie theater in its path and caused almost no damage to it. Was that because it was weakening at that area or because the movie theater was incredibly well built? I have a hard time beliving it handled 200mph+ winds with almost no damage at all. Would you agree with the statements made by certain weatherman that “it was the worst tornado damage ever seen and quite possibly the deadliest tornado in U.S. history”? How would you compare the Moore 2013 tornado with “The ultimate EF 5” in Hackelburg/Phil Campbell? 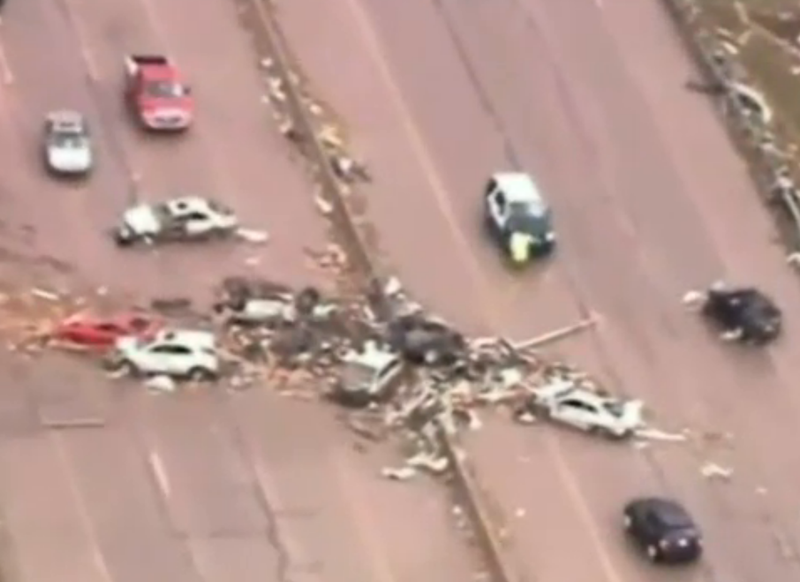 James – the Moore tornado was extremely intense but definitely not the deadliest nor the worst in US history. Four tornadoes in 2011 caused more fatalities and similar/more intense damage. William – the Phil Campbell tornado was much faster moving, had a significantly longer damage path and likely had even higher surface winds. This was a very powerful tornado but will it mainly be going down in history because of modern day media attention? Im not trying to downplay it but why will it go in the record books? It was an EF5 tornado, impacted a heavily populated area and caused more than 20 deaths while dozens of people filmed it. Has the hallmark of all infamous tornadoes since the dawn of the home video age – like Andover ’91, Bridge Creek ’99, Tuscaloosa ’11. I’m going to make an educated guess and put this on par with the 1998 Birmingham tornado and the 1990 Plainfield tornado. Both had limited F5 damage (and the worst damage being at schools, just like in Moore) and killed 20-30 people. Not as mindblowing as Andover or Bridge Creek 99, but horrible enough. Except I think the Moore tornado was probably more intense than the ’98 Birmingham event. I have yet to see any images of EF5 damage from that event. The Plainfield tornado is hard to compare as it caused F5 damage to an empty cornfield and no buildings, but the fact that every vehicle caught in the tornado’s central damage swath was hurled between 100 and 600 yards is a good indicator it may have briefly been as strong as the Moore storm. I have been surveying the El Reno and Moore tornado damage paths the past two days and am surprised at the lack of clear EF5 damage indicators in the El Reno damage path. I have driven through and walked the entire area east of the 81 and have found no instances of completely debarked trees or pronounced ground scouring, although the vegetation in some areas was damaged and blown to the ground. http://weather.yahoo.com/deadly-okla-tornado-widest-record-rare-ef5-170412039.html Just how accurate would this be? There is quite a bit of subjectivity in determining the “widest” tornado ever recorded. The 1999 Mulhall tornado probably would have left a wider swath of EF3+ damage had it tracked through a populated area, but the 2013 El Reno tornado may have left a more complex damage swath. When more of the data is released in the coming months it will be easier to make a comparison. 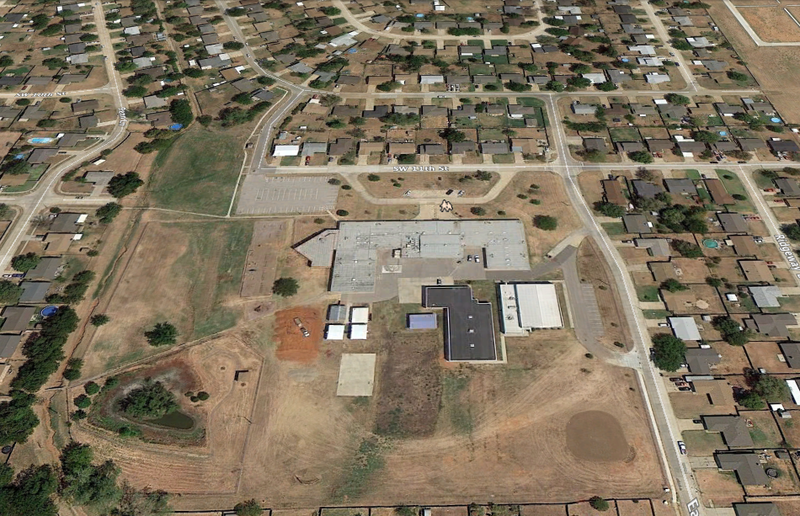 When will you be posting damage pictures from your El Reno tornado survey? And could the lack of EF5 damage be the result of there being few buildings and trees? Hi I really enjoy reading your analysis of the Moore storm as well as others I think you have some very accurate observations! 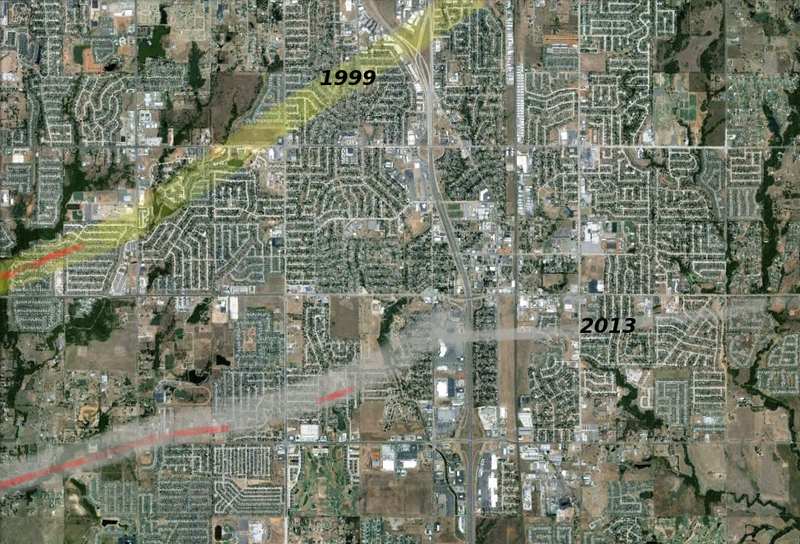 I was amazed when the Moore tornado of 2013 hit virtually in the same area as the 1999 one. And another EF-5 to top it all off! I think the 2013 tornado was stronger in terms of overall wind speed while it was in Moore compared to the 1999 storm just based on the damage, although the 99 one was very very powerful. 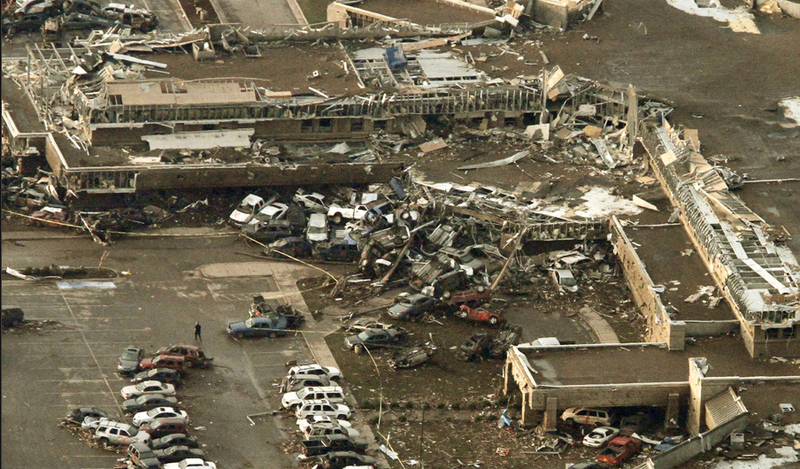 The 1999 tornado had been on the ground much longer when it finally arrived in Moore. It peaked around Bridge Creek in terms of intensity, that was where around the I-44 interchange that the DOW recorded the ~301-318 mph wind speed. After that, the 99 storm cycled down as it moved northeast but reached one last peak just as it moved into Moore. It was still very potent. The 2013 tornado in contrast formed rather rapidly outside of Moore and very quickly crossed I-44 where it reached to around EF-4 strength rapidly. The rate of intensification of the 2013 Moore storm parallels in some way the Joplin tornado, although Joplin basically went straight to EF-5 strength in no time. It was just a few miles after crossing I-44 before reaching I-35 that the 2013 tornado peaked reaching spurts of EF-5 strength. Watching some of the videos the rotation and inflow is simply mind blowing and I think it easily must have had some winds of around 250mph or more. The 2013 Moore tornado also closely resembled the 99 storm in shape, it basically kept a low wedge shape its entire life cycle until it finally diminished after crossing I-35. It was more rain wrapped than the 99 storm also. Actually at points it reminded me of the immense Joplin storm, from some of the helicopter shots. Truly a historic storm. Lets hope Moore catches a break! Due to the multiple vortices in this tornado, is that why some walls and partial roofing were left intact at Briarwood and Plaza Towers? 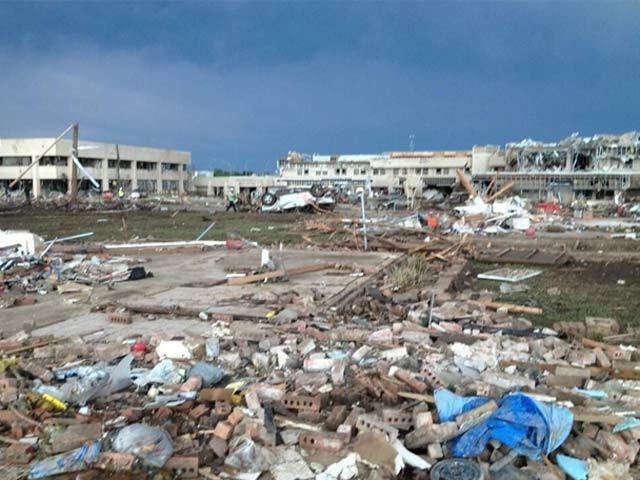 I was wondering why the schools wouldn’t have been completely swept away or leveled in typical EF5 fashion unless the vortices were very narrow and only affected certain parts of the buildings? Is that how it usually works in EF5s with multiple vortices? Did the 2013 Moore tornado do more EF-5 damage than the Joplin storm, even though the Joplin tornado caused more deaths? I’d say the two tornadoes were pretty comparable at maximum intensity, but the Joplin tornado was wider and caused quite a bit more instances of probable EF5 damage. An analysis of the 2011 Joplin tornado by Paul and Stimers (download at: http://www.academia.edu ) concluded that the significant number of fatalities (160) were due partly to a lack of awareness: 11% didn’t hear warning sirens and 21% ignored the warnings. The reaction of Moore residents, perhaps because they were more experienced with big tornadoes, was much better, especially considering that two elementary schools and a hospital took direct hits (Joplin tornado was on a Sunday, and Moore tornado hit just as schools were letting out for the day on a Monday). A NWS analysis of the Joplin tornado concluded that 15% of the fatalities were residents standing OUTSIDE of their homes, looking for (or perhaps taking videos?) the tornado. 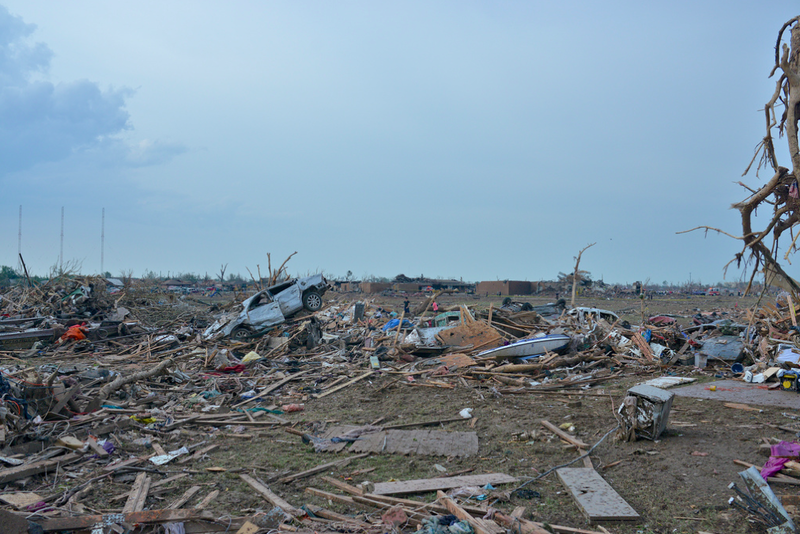 While many Joplin residents continue to think the number of deaths was low, relative to what it could have been, most of the post-tornado research indicates that the number of fatalities was far higher than it should have been. 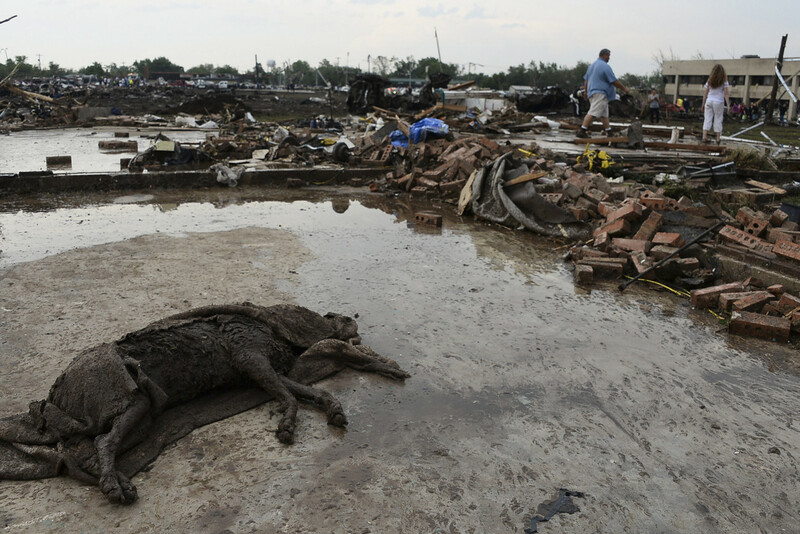 The Joplin tornado death toll should have been more comparable to the 24 fatalities in Moore. Bob, I strongly disagree. 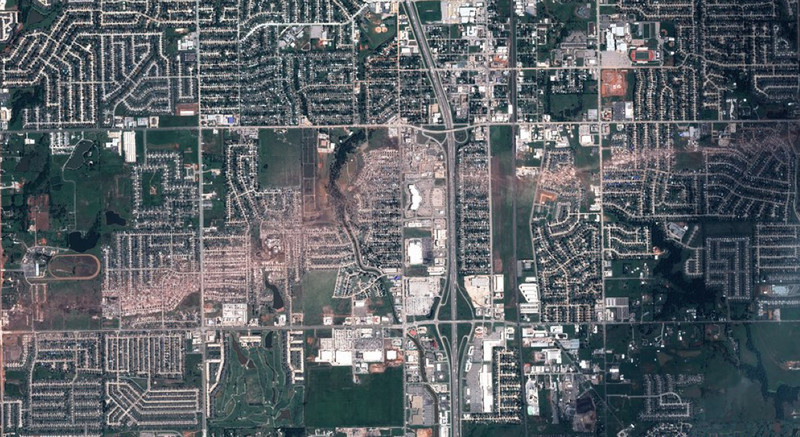 The Joplin tornado was completely rain-wrapped, developed rapidly at the edge of the city and obliterated significantly more homes than the Moore tornado. 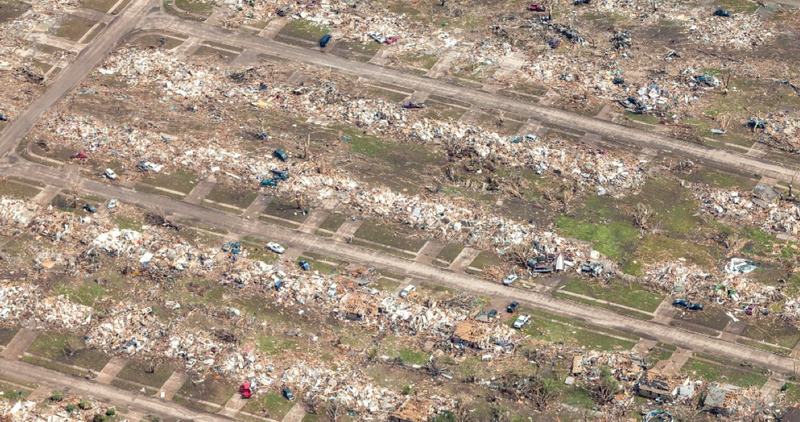 The Moore tornado occurred in an extremely tornado-ready area, was highly visible for more than 30 minutes before impacting the area and left a narrower damage path. Had the Moore tornado occurred under the same meteorological circumstances as the Joplin tornado, it would probably have caused 2 or 3x as many fatalities. The visibility of a tornado is an important factor in fatality rates, and the Joplin tornado was completely obscured to those in its path. I also don’t know where you read that 15% of the deaths in Joplin were “residents standing outside of their homes” but that is simply not true. I don’t believe a single documented fatality was a person simply standing outside – there were several people caught running out in the open – but nearly all of the deaths were in structures or vehicles. The 158 deaths from the Joplin storm was not high – it was exceptionally low (though it would have been lower in Oklahoma) and a testament to severe weather preparedness and media warnings. I should have clarified the “15% outside their homes” comment, which I do recall reading but can’t find the source. Several accounts indicate that about 14% of the deaths were victims caught outside of their homes, i.e. in vehicles or out in the open. So, I stand corrected on that point. The NWS report at: http://www.nws.noaa.gov/os/assessments/pdfs/Joplin_tornado.pdf states that “the majority of Joplin residents did not take protective action until processing additional credible confirmation of the threat and its magnitude from a non-routine, extraordinary risk trigger… including physical observation of the tornado.” Confusion over what the warning sirens actually meant, complacency and other factors are cited in the NWS report for the fatality count. The 158 casualties really are too high, according to the consensus of the reports analyzing the Joplin tornado and the local response. The Joplin tornado was rain-wrapped, which isn’t unusual. The Moore tornado was DEFINITELY NOT “HIGHLY VISIBLE FOR MORE THAN 30 MINUTES.” That is simply not true. The average “lead-time” (warning sirens to impact) for Moore residents was officially stated as 16 minutes. Like the Joplin 2011 tornado, it started just outside of town as a rather innocuous-looking thunderstorm, then exploded into an F2 or F3 tornado just as it reached the ground at the outskirts of a populated area, It then grew very rapidly into an F4-F5 tornado that wasn’t directly visible, either, since it was wrapped in a “debris cloud,” estimated at approx 2 miles in diameter enclosing the tornado (perhaps 1 mile in diameter). NOAA has some nice 3D visualizations of the Moore tornado: http://www.ncdc.noaa.gov/news/visualizing-may-2013-moore-oklahoma-tornado. I don’t know how many advisories were issued to Joplin residents, but the Moore tornado occurred on the third day of a well-publicized high risk period. A deadly EF-4 had raked the edge of Shawnee about 30 miles east the previous day, and big storm cells with tornado potential were popping up in several places in Central Oklahoma on May 20. Once the warning sirens were engaged (they all go off simultaneously with the click of an “Enter” key at the NWS in Norman), everyone here (I live in OKC) knows what to do: turn on your TV and see where it is relative to you. Looking for visual confirmation by stepping outside can be suicidal, as that rarely works, and wastes valuable time that you need for gathering up people, pets and laptops, and – if it’s F4 or greater and you can’t get below ground – you have to calculate your odds of safely packing them all up into the car of choice (usually whichever one has the highest remaining balance due) and getting out of its way. That said, the incredible “El Reno” EF-5 tornado west of OKC on May 31 grew very dramatically to a world-record 2.6-miles in diameter, plucked off a couple of storm chasers when it abruptly changed course and increased in speed, then spent nearly an hour posing for pictures out on the prairie. Perhaps because of the Moore tornado just 11 days earlier, a million or so people were traumatized by the images. The resulting mass hysteria created a potential Katrina-scale disaster when thousands of people were trapped in a giant traffic jam with the thing bearing down on the core of OKC. We were very lucky that the monster took pity on us, and decided to disappear (then dump up to 11 inches over the next 8 hours, raising the death toll to 22, mostly from flooding). The excellent response by Moore residents with 15 minutes lead-time was in stark contrast to the mass hysteria on May 31. A 2014 review of the damage in Moore by Kiel Ortega has upgraded several locations in Moore from EF4 to EF5. At the same time, the EF5 rating at Briarwood is coming under scrutiny due to structural flaws at that location. Great link – seems to match some of my personal observations that there was more EF5 damage than Briarwood. I find it particularly interesting that they labeled the damage at the crest of the damage path in Moore (below the 7-Eleven) as EF5. 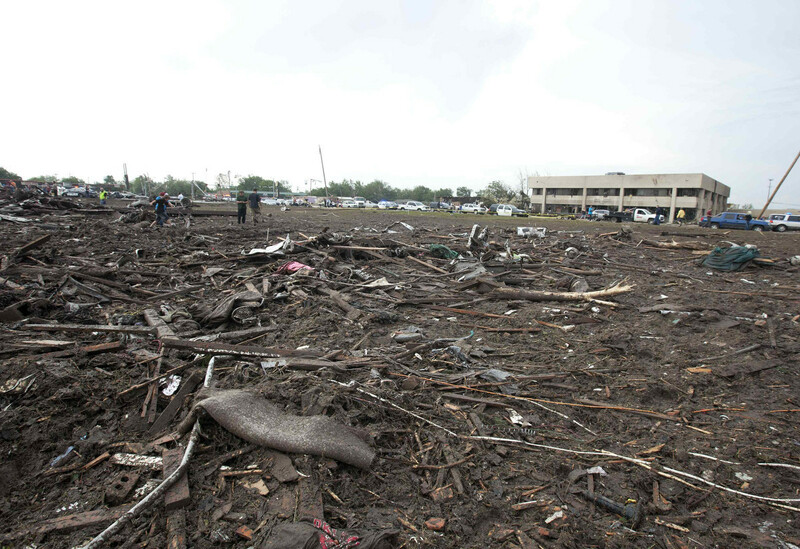 I felt the severity of the damage there, and just south of Plaza Towers, was the worst in the city of Moore. I think the reason they didn’t go EF5 in the Plaza Towers area was the fact that those rows of homes that were slabbed were nailed, rather than bolted down. Overall context still seemed to be indicative of an extremely violent tornado, but I agree with the rating there.